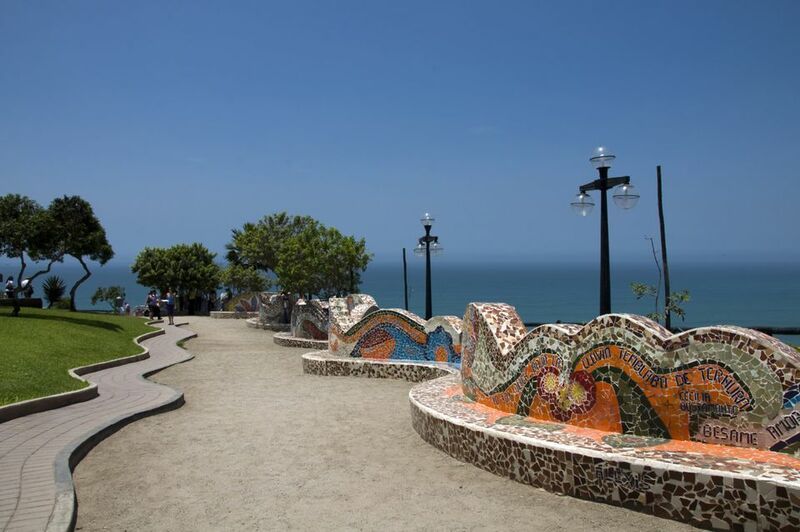 Of all the parks along Lima’s scenic coastal strip, the Parque del Amor is arguably the most famous. And with its coastal views, flowerbeds, colorful mosaics, and a giant embracing couple, it’s certainly the most romantic. Inaugurated on February 14 (Valentine’s Day), 1993, Lima’s “Love Park” was built to celebrate love in all its forms. This is most clearly represented by the park’s central sculpture, El Beso (The Kiss). Created by Peruvian artist Victor Delfín, El Beso shows a man and a woman wrapped in each other’s arms, locked in a passionate kiss. The park is said to be inspired, at least in part, by Parc Güell in Barcelona, which was designed by Antoni Gaudí and opened to the public in 1926. Lima’s Parque del Amor is much smaller and far more modest, but it’s easy to see why the colorful mosaics along the undulating walls and benches are often compared to Gaudí’s mosaics in Barcelona. The final line above is particularly appropriate considering the panoramic views of the coastline and the Pacific Ocean from the Parque del Amor and its cliff-top location. On a clear day, you can see all along the coast of Lima and far out to sea -- you can see surfers down below, boats on the horizon, and people paragliding from the nearby Parque Raimondi. Inside the park itself, you’ll see lovers both young and old -- novios and newlyweds and long-married couples -- enjoying the romantic atmosphere. Lima's newlyweds often head to the park to mark their marriage with a kiss in front of El Beso. On Valentine’s Day, meanwhile, expect to see large crowds of amorous couples. The most expressive and least camera shy of these couples will take place in the annual Valentine's kissing competition, in which the longest kiss of the day takes all the plaudits. The Parque del Amor is located along the Malecón in the Miraflores district of Lima. If you're already on the coastal strip, it’s a short walk south of Parque Raimondi (the paragliding hotspot) and about half a mile north along the coast from the Larcomar shopping complex. If you're in the center of Miraflores in or around Parque Kennedy, head toward the coast along the main road that runs along the western side of the park (known as Diagonal and then Malecón Balta). This road soon reaches the coast (after a 10- to 15-minute walk), at which point you'll find yourself just across from the Parque del Amor.